Recently, I was sat in my boyfriend’s parents living room watching Lenny Henry’s BBC Commonwealth documentary. Lenny, the comedian born in Birmingham to parents from the Windrush generation, went around the Caribbean to find out the importance of the Commonwealth and its relevance today. Unbeknown to the people I was watching with, I was quietly enraged at the celebration of the Commonwealth when the UK colonised, drained, and spat out those Caribbean countries once they were of no use. But it wasn’t just the acts of the past that were getting me vexed – it was the way in which descendants of the Commonwealth who live in Britain are currently being treated. At present, the Home Office is unable to tell us how many people have lost their homes, jobs and access to the NHS and benefits due to the ‘hostile environment’ implemented by Theresa May. People who have lived here for most of their lives, paid their taxes, and raised families here are now having their Britishness brought into question, and being asked to provide impossible documentation to prove that they are here legally. These are people (and children of the people) who were invited to this very country so that they could help rebuild it. Behind the headlines, this is an issue that cuts to my core. It’s a personal one; it scares me. It involves my father. Over the last few years, my dad has repeatedly had his passport request denied, and I’d like to share his story. My dad was born here in 1969, in Birmingham, to two parents from the Caribbean who came over here as part of the Windrush generation. He was the second youngest born into a large family. His father was in and mostly out of his life. My dad’s side of the family remind me of a typical Caribbean family, in which the past is rarely talked about. A lot of my dad’s childhood can often feel like a massive mystery. But I do know he met my mum aged 17 at drama school, drawn to her great legs. The two began sending letters to each other and dating, and a year later she was pregnant with my brother. Two years later, they had me. Like most young relationships, sadly theirs didn’t last, and both went on to start second families with new partners. 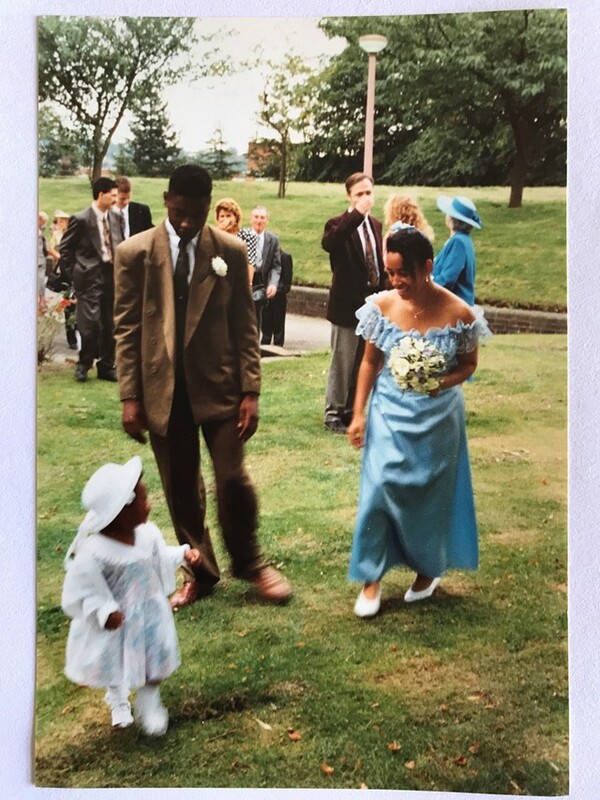 You may wonder why this is a This Is My Life story, but it’s important to me to share – my dad is not a statistic or a case study, he’s a real man. I fondly remember how, through my brother and I, my dad was able to be a big kid – we had some fun weekends, always a new adventure, new games to play, or a new sport to try out. We went everywhere with him, including acting auditions. My dad was an actor - and I was super proud! He’d been in The Bill (this was a big deal in the 90s), in Romeo and Juliet at the theatre, made a film in Spain, and toured Hong Kong. I’d like to think if he’d have carried on he would have been Adrian Leicester, or Idris Elba. But he gave it all up to become a family man, and give more time to his religion. Here is where the plot thickens. As mentioned, my dad was born here – so he is British, right? As I’ve also mentioned, he has travelled, so he has had passports in the past. And yet, in 2013 his passport renewal was denied, problems arose when my dad booked a holiday to go to France to treat my little sister who had passed her GCSEs. As the holiday approached, he realised his passport was out of date, and went to fast track an application. He was told to come in for a meeting, and his application was denied. Why? They said that can’t prove he is who he is. Now here is where it gets complicated, so stay with me. My dad was born Roger James Walters. In his teenage life, he assumed the last name Sewell, as requested by his father, a “failed bonding” exercise as my dad describes it. His father wanted to unify everyone’s last name (Walters was his mother’s maiden name). In his adult life, he legally changed his name to Tunde Oba, as Walters and Sewell were both names of previous slave masters. The solicitors that did his name change made a mistake, and legally changed his name to Tunde Oba from Roger James Sewell, not from Walters. The mistake was pointed out when he went to get his National Clearance in 2016, so he respectively went back and changed it correctly, thus being granted National Clearance. In 2017, the Passport Office took none of that on board, and even went a step further by calling the prison my dad was preaching in to tell them to revoke his National Clearance, as he wasn’t who he said he was. Naturally, he appealed the decision, and this time around he provided his deceased mum’s birth certificate, her passport and childhood photos, an affidavit from his two sisters, copies of their passports in the name of Walters, 600 pages of National Insurance documents to prove he has worked from the age of 16, a copy of his birth certificate, and his past passports. His appeal was declined, on the basis that they wanted further evidence of his estranged father’s passport and birth certificate, and more childhood photos. So he applied again. This time, he sent a statement as to why he couldn’t provide his father’s documents and why he had no more childhood photos, due to a fire. He included a letter from the DVLA, copies of his licenses in those names, letters from his doctor and school, and YouTube links with his acting credits. Once again, he was rejected on the basis he couldn’t provide his father’s documents and his original birth certificate (something many of us wouldn’t be able to do – many people only have copies). As you can see, my dad has found himself in an impossible situation. At first, he laughed and joked about “who really needs a passport?”, to which my response was, “It’s your freedom and it’s your right!” I’ve laid awake at night making elaborate plans to prove who he is – from DNA tests, to finding a biometric expert who can study his childhood photos and his adult face. It’s an injustice, and there have been many repercussions for him: he is no longer able to work in prisons with young men, something he was passionate about as a volunteer, and he’s been unable to work abroad or join his family on a plane. Now, he is angry – rightly so. We all are. If he was a white man changing his name from John James to Richard Cook, would he have faced the same interrogation as to why he changed his name to an African name when he isn’t African? (Yes, they asked him that in the interview). I doubt it. Is it because my dad is a descendant from the Windrush generation that he was advised to get a Jamaican passport, despite not being born there? Is it fair that he has had the same passport office case worker working across all of his applications and appeals? As a black man of 49, my dad has broken all stereotypes of how his life was meant to be. He has been a present dad, worked hard, paid his taxes; he owns his house, and is God fearing. But still, in one fell swoop, he has been reminded that in this country, if you are a person of colour, you are still at the bottom, and your contributions mean nothing. I think it’s high time my dad had the right to peace of mind about his place in this country – and, at the very least, a holiday abroad.